Salmon-tinged clouds and a morning mirror make for a pretty shot. I’m going to use this one, I guess it’s a seascape, to feature my beach landscape vocabulary along with a few contextual annotations. If you want to follow along, I’ll use the photograph above to introduce you to a generic vocabulary of the beach landscape. On the far left center, that’s the surf zone. Now let your view drift down and landward to the foamy shallow water pushing its way up the beach. That’s swash. The reflective surface above the swash is the mirror. You’ll see shorebirds foraging in the mirror. Now let your eye travel up above the mirror to a band of dark wet sand and then a lighter band of dry sand. Fresh drifted debris accumulates in the driftline or tideline anywhere between the top of the swash and the base of the backshore. In this image dry sand ends abruptly against the eroded base of the backshore, which is usually an elevated shelf. 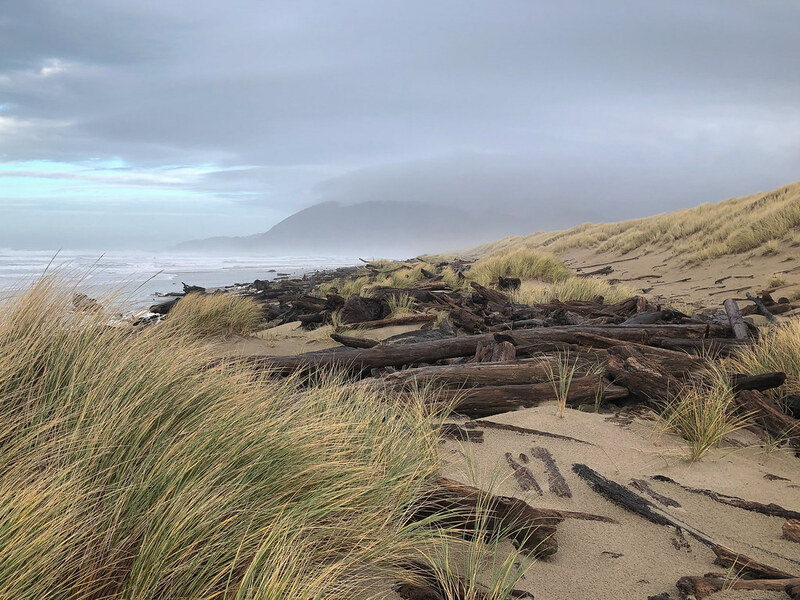 All the big wrack- drifted logs, buoys, commercial fishing and crabbing gear, and lost docks and drifted building materials- ends up on the backshore shelf. Landward, the foredune looms over the backshore shelf. Behind that, coastal mountains and the clouds and sky above. Ready to take a quiz? 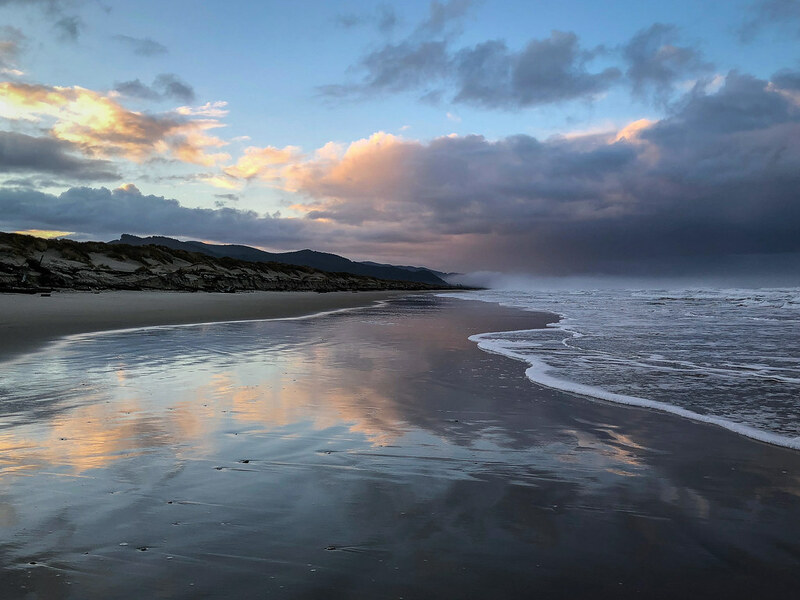 Using the photo below and the vocabulary I laid out above, where on the generic beach landscape is the photographer standing? Thanks for taking the quiz. These are the words I find myself using when I’m walking on the beach or describing a walk on the beach. Do you think I’m using them correctly? Do you have alternatives? I’m also interested in your thoughts about beach features or terms I may have missed. Two remarkable landscape photos! The reflections of the clouds is stunning! Thank you, and thanks for a wonderful challenge. Backshore shelf? Your seascape is luscious. My favorite area is the mirror… twice the sunsets for the price of one! Thanks for taking my quiz. Nothin’ but net! I’m with you, love the mirror. Thanks for taking my quiz. Nailed it! Are you on the backshore shelf? I loved learning this new vocabulary, which brings with it the opportunity to look so much more carefully at what is otherwise simply a beach. I can’t guarantee I’ll remember the words, but the lesson itself will stay with me. Thanks! Yes Margaret, the backshore shelf, where all the big driftwood accumulates. Thank you for taking my quiz. I always learn something(s) new from your posts, Steve! Hi Lindy, Thank you! It’s a pleasure to be blogging buddies with you. Great shores – and the mirror too. Landscapes of serene beauty.